I’d never been to Belgium before, not because I’ve got anything against it as a Country, it’s just the chance has never arisen. 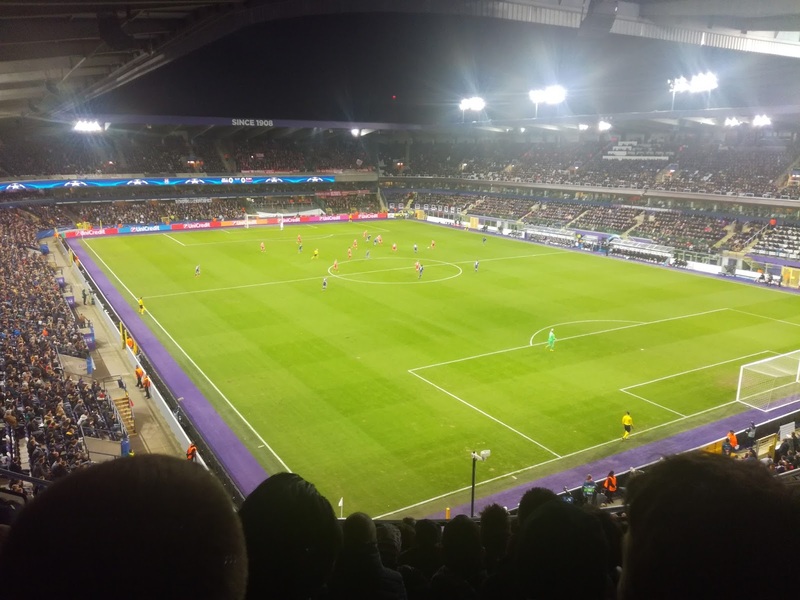 I did come close once when we went to Tilburg for a game, but because we overlay that morning, we ran out of time to make a token trip over the border just to add another Country to the list! 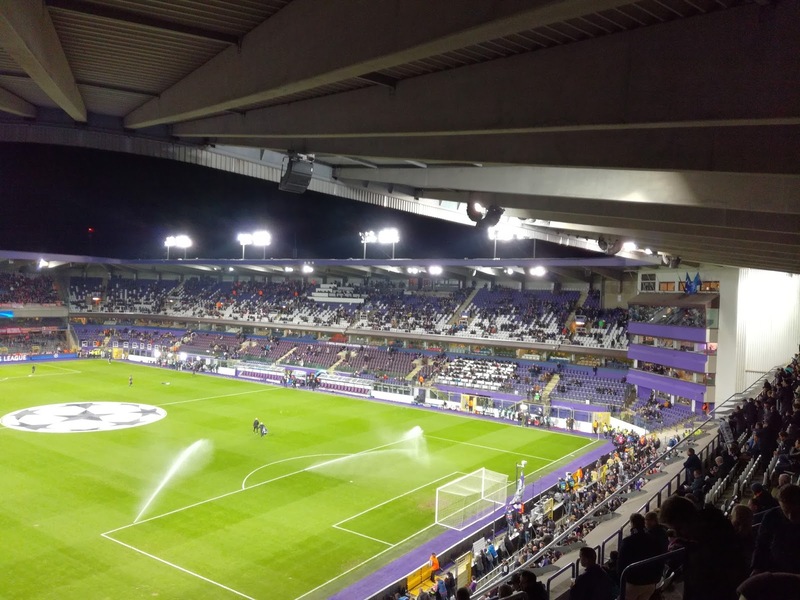 Anderlecht at home presented a great opportunity, but this was not going to be easy. Tickets were rarer than the proverbial rocking horse manure, but thanks to a contact in Duiven who was pretty well connected, we finally got confirmation on the day before we travelled to Holland that the tickets had been secured. It was a pretty chunky drive to Brussels, or should I say a pretty chunky journey home afterwards (close on three hours) so a sensible decision was made to book a hotel. That was my job, but more on that later…..
With me at the wheel, it was a lunchtime departure from Duiven, which took us down towards the edges of Eindhoven, before heading over the border and on to Antwerp. The traffic was significantly busier around Antwerp and after some hold ups we were finally on the motorway that went past Mechelen and onto the Brussels ring road. The Brussels ring road is not a road I would want to tackle every day, it was horrendous and that part of the journey to our base took an hour. Base was found, it was a modest hotel in the Anderlecht area in the South West of the City, and to be fair, on first glances it became clear the locality was not the best, especially when it became apparent that I’d managed to book a hotel that was a small grenade’s throw away from the notorious Molenbeek area, sometimes known in the European media as Jihadi Central….officially the second poorest municipality in Belgium. 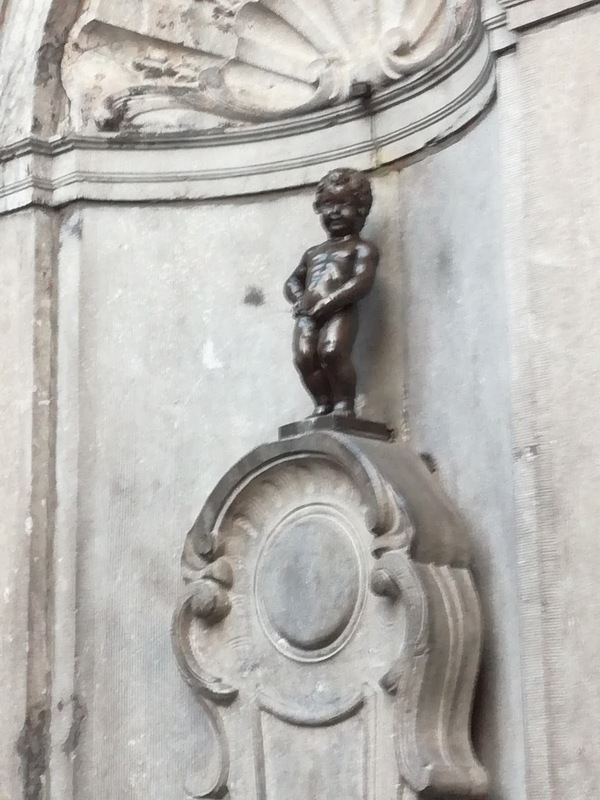 Confidence was not restored as we walked from the Hotel (which was fine by the way) to the Grand Place, the place was run down, and quite frankly, dirty. Immigration is clearly something that Brussels has had to contend with like many major European Cities, and by their own admission, they are losing the battle, and more worryingly, citing Molenbeek as the example, they are also losing control. 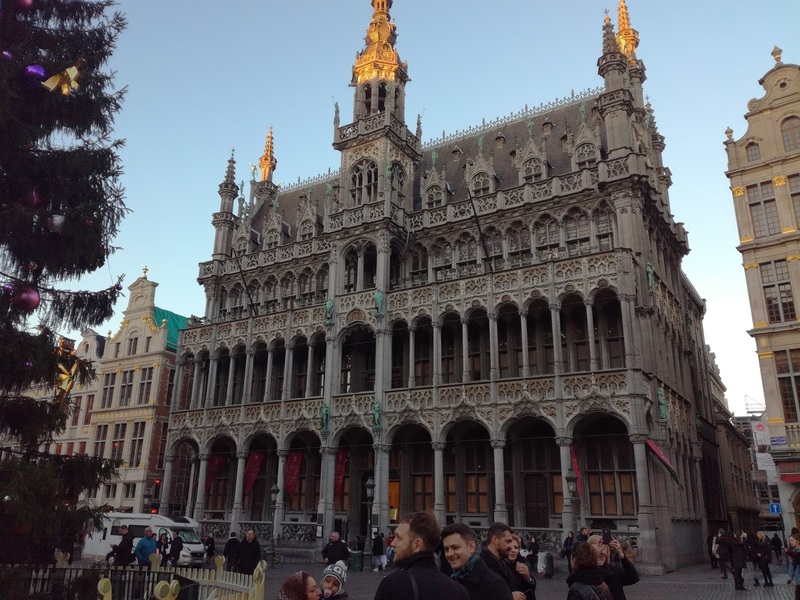 The Grand Place is beautiful, the architecture stunning, the bars and restaurants warm and inviting on a cold day. We tested out the famous Delirium Bar, which was something of a disappointment, but maybe we caught it on a bad day, given some of the reviews? A restaurant was found, and that was superb, but it was time to find the Brussels Metro and take the underground to the Constant Vanden Stock Stadium in Anderlecht. This was achieved without too much trouble, and to be fair, as we disembarked the train and walked up to ground level, it looked to be located in a pleasant residential area. Two minutes later and we were upon the stadium which is tucked in, surrounded by trees and tall houses, on a non-match day, especially at night, it would be easy to walk past it and miss it. The ground was quite small, and had a very Nineties feel about the build. With the stands a continuous oval around the pitch, it was not dissimilar to the stadiums we’ve seen built at the likes of Derby and Middlesbrough, although on a much smaller scale, having a capacity of just over 21,000. 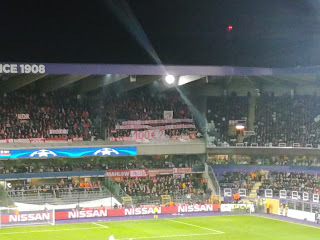 We took our seats, in the North East corner, and despite not having gained a single point in this seasons Champions League campaign, the Anderlecht fans were in full voice, whereas their German counterparts unfurled a banner protesting at the fact they’d been charged 100 Euros per ticket to watch the game. 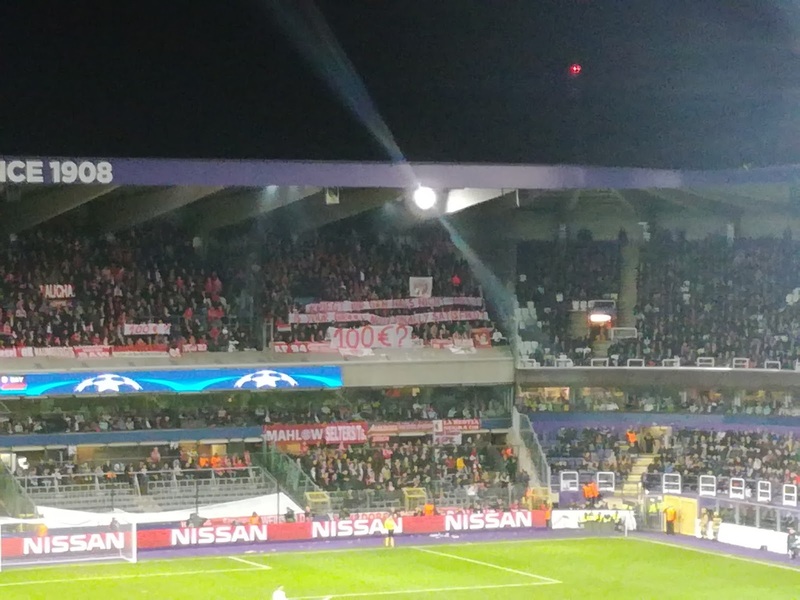 By half time the score was 0-0 and not particularly inspiring, but with Bayern and indeed PSG having romped the group at the expense of both Anderlecht and Celtic, neither side was especially going hell for leather. Robert Lewandowki produced a clinical finish from a fantastic move just after half time before Sofiane Hanni found the net to equalise for Anderlecht three minutes over the hour mark. The lead was restored with 13 minutes remaining when another swift move and clinical incisive play saw Corentin Tolisso stoop low to meet a ball from the right with his head and finish superbly. To be fair to Anderlecht, they put up a great fight and they were roundly applauded by their fans at the final whistle, but the Champions League experience has told them that the gap between the European super powers and the rest is vast. 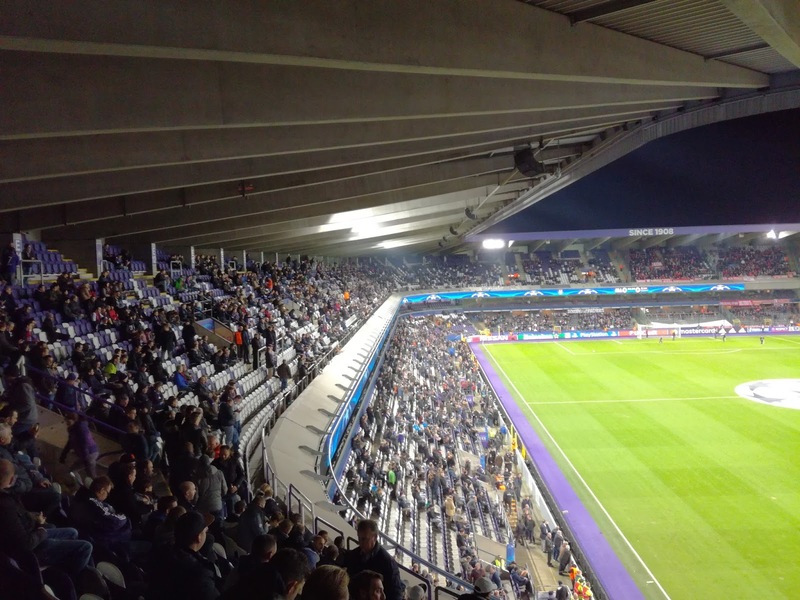 Once in a while Anderlecht were winning cups in Europe, they are a million miles from that now, as are teams from Holland for that matter. 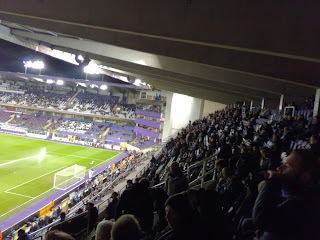 We decided to let the crowds dissipate at the final whistle by having a couple of beers in a bar opposite the stadium, but even then as we returned to the Metro we were greeted by a number of armed soldiers and a battery of Police officers not allowing fans onto the platform. Fifteen or so minutes passed by, it appeared they were trying to get the German’s away from the area. All was quiet on the ten minute walk from the Metro to the hotel, albeit we did manage to disturb a rat that was rummaging through some rubbish. A couple of bars were open, but they didn’t look in the slightest bit inviting, an attempt to get the hotel to serve us a beer was not successful, so the next best option was to go to bed. I’ll be honest, as much as it was an interesting experience, I won’t be rushing back to Brussels any time soon. Maybe we just happened upon the wrong area, but the drive from the South of the City to the North the following morning did not give you any sort of confidence that it was better elsewhere. Still, they do serve an absolutely cracking pint of Jupiler, and for that alone, I might just give the Belgians another chance, but it won’t be anywhere near the Capital.